Children at Lympstone Pre-school are enjoying some new high-tech toys thanks to a generous donation from a local business. Troy Clements and Jenna Taylor from Let’s Talk Mobiles in Exmouth donated two iPad Minis, a large iPad, a number of indestructible headphones as well as a bunch of other useful tech goodies to the pre-school. The iPads came in child-friendly covers with a special colouring-in app for the youngsters. Practice manager Vicki Drinkwater was delighted with the donation and excited to see her pupils get to grips with the new equipment. 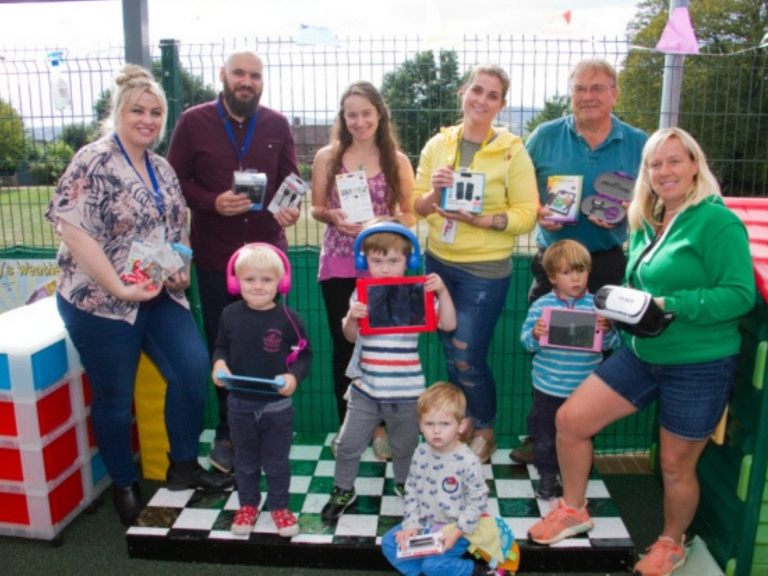 “It’s fantastic for the pre-school and I am sure our children will be able to use the tablets to great effect, it felt like Christmas had come early,” said Vicki. Troy and Jenna from Lets Talk Mobiles visited the pre-school on Friday, September 14, to donate the equipment. Why not check out this Mobile Phones business in Exeter. Lets Talk Mobiles is a 'thebestof' business member.